Recently I came across a copy of Microsoft Word for DOS 1.15. I had been looking for Word for DOS 1.x for some time. It's not quite 1.00, but for the purpose of seeing how it worked, it is close enough. The 1.00 Microsoft Word PC World Demo also turned up. The only noticeable difference in the demo is that saving files is disabled. 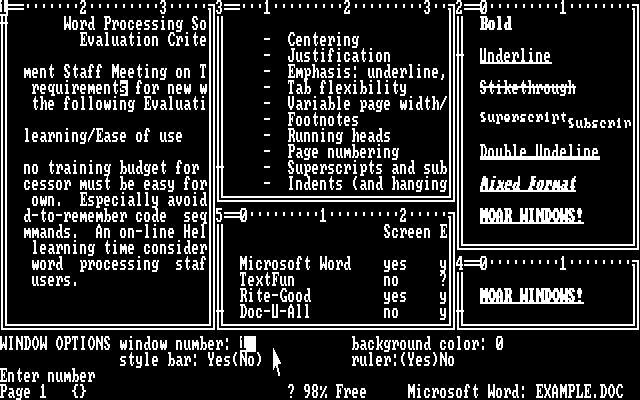 Microsoft Word 1.00 for IBM PC/MS DOS was released in late 1983. It is possible, but not well documented, that there may have been earlier releases for Microsoft Xenix under the Multi-Tool name. To add to the confusion, some advertisements in InfoWorld refer to "Multi-Tool Word" for the IBM PC as late as August 1984. Also, a 1984 Byte review also refers to it as Multi-Tool Word. 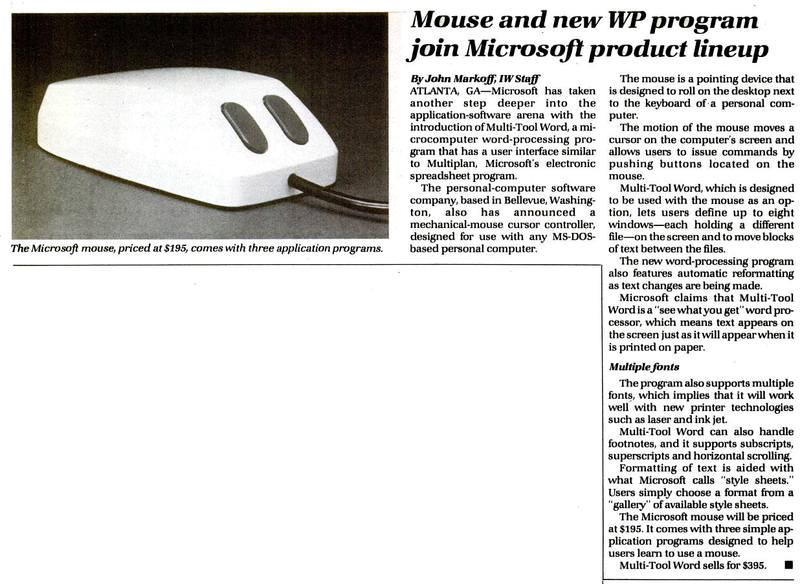 To me, the really interesting thing about Word 1.x for DOS is that it was often bundled with a Microsoft Mouse and competed against Visi Corp Visi On and its Visi On mouse, as well as the Apple Lisa/Mac. If I put Word 1.x next to Visi On, I can almost feel them trying to reach out and violently kill each other. On a side note, Visi On, Mouse Systems, and other mice were often bundled with ZSoft PC Paintbrush. This program was assimilated and is now known today as Microsoft Windows Paint. BTW, the bacon lover on the right is a 1980s HP touch screen. More on that later. 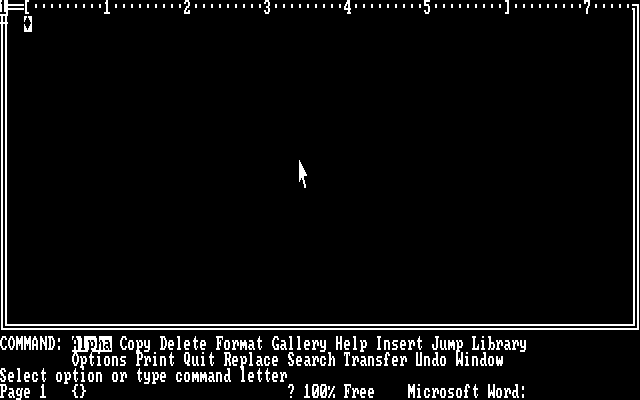 Word 1.0 for DOS sported a "Graphical User Interface" of sorts and you could use it with the brand new Microsoft Mouse. Word for DOS starts up in CGA graphics mode. If a mouse driver is present, a mouse cursor will appear on the screen. The most interesting thing about this user interface is that it is relatively free from the influence of Apple's Lisa/Mac user interfaces. The design clearly shows its roots as a text mode Microsoft Xenix product, and uses a "command bar" that was common among other products of the time. The command bar acts as a menu of the options available in the program. You can select a command with the keyboard or mouse. Unlike Visi On Word, Microsoft Word for DOS is a native DOS application and does not require a separate Application Manager or GUI library. 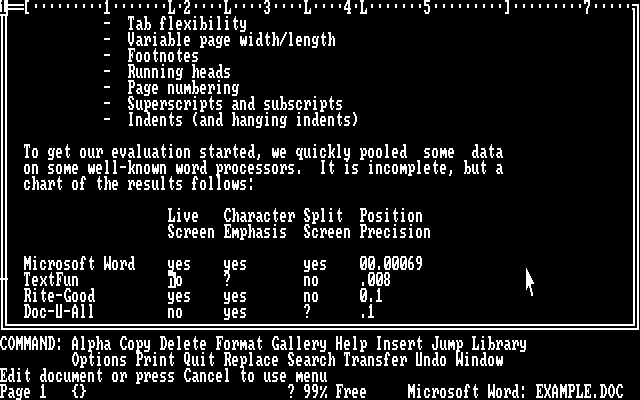 After some examination, it does appear that Microsoft "Notepad" for DOS, included with their 1983 Mouse Driver, is in fact a scaled down version of Word for DOS. 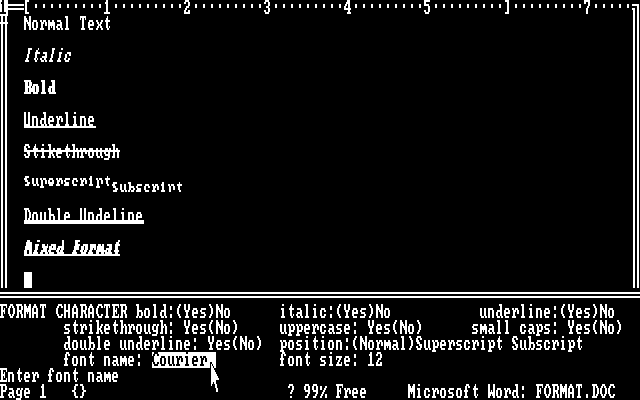 There were some rumors that Word for DOS shared some code with "Interface Manager" (early Windows) but I just don't see it. 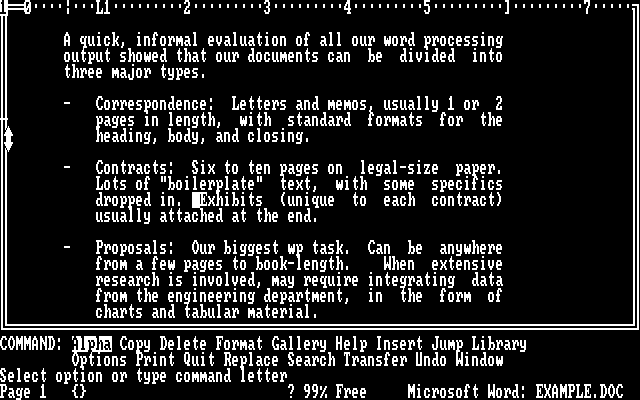 Microsoft Word for DOS had some features that were considered advanced for its time. These included: Style sheets, a style sheet "gallery", tables, and paragraph formatting. Microsoft heavily advertised Word for DOS as a "WYSIWYG" (What You See Is What You Get) environment. Word for DOS 1.x makes use of the 640*200*2 monochrome CGA graphics mode. In this mode, it will display italic, underlined, bold, superscript, or subscript text. It can also display any mixed combination of those. Although Microsoft Word for DOS permits you to specify different fonts and sizes, it does NOT display different fonts or sizes on the screen. In comparison, Bravo on the Xerox Alto or the Apple Lisa could could display different font sizes, giving a much truer "WYSIWYG" environment. This screen shot also shows an option menu (similar in function to a dialog box). You can set options using the mouse. There are no graphical widgets such as check boxes, or radio buttons. Microsoft Word for DOS can display different documents, or different parts of the same document, in two or more "windows". Wow! It is already more advanced than Windows 8 Metro! Because Microsoft Word for DOS was designed for text mode, it does not have visual things to click on. (Then again, neither does Windows 8!). 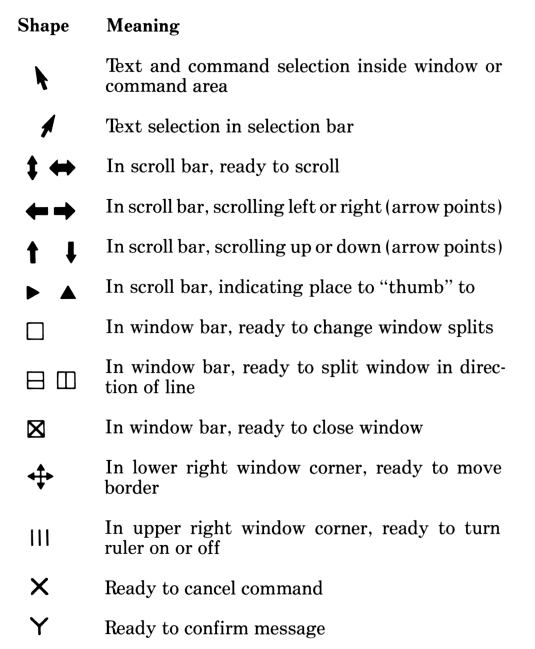 Functionality of a screen area is instead indicated by changing the shape of the mouse cursor. The list above is from the Microsoft Word for DOS manual. For example: to scroll the document, move the mouse cursor to the far left edge. The cursor changes in to a vertical double arrow. Then you use the left and right mouse buttons to scroll up or down respectively. - A vast difference from the single button approach used by Apple and others.